I'm sitting here on the plane to San Francisco (more than halfway there, 6 hours to go) and while most people around me are snoozing or reading or staring at seat-back movie screens, I'm sitting here with my IPad. It's what you'd be doing too, I bet. 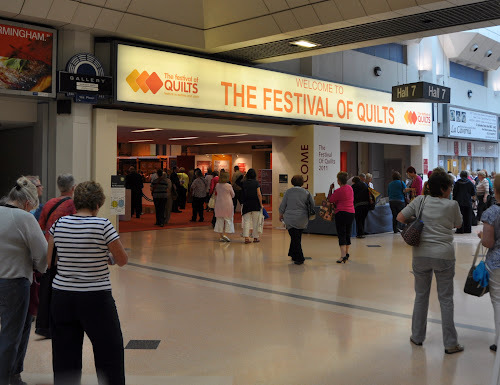 I'm thinking about our 4 days at Festival of Quilts, and here is my question for you: how did the Festival experience affect you? What will you take away from it? How did it inspire you? Here is what I keep thinking about. The talks we heard from Fiona Wilson and from Linda and Laura Kemshall really crystallized for me how a sketchbook can be useful in developing ideas. This is such a simple idea And of course we get the obvious concept but seeing those lectures really SHOWED how thoughts and basic images developed into final designs in a way that has hit me differently. It was the progression of developing ideas, I guess. So I feel like I've come away with a new understanding of the importance of getting really familiar with the core idea or image one is exploring, and the value of visually exploring imagery in different ways and from different angles. I'm also thinking about stitch somewhat differently, I think. You know how I love machine quilting and I always enjoy exploring how different quilting can dramatically change a piece. At Festival I felt like I was seeing hand stitching and embroidery used in a different way than I've seen ... Not just random seed stitches or French knots scattered around for texture, if you get what I mean, (which can be a wonderful accent -- I'm not denigrating that) but in ways that were absolutely integral to the content of the piece. And then there is the question I told you I kept thinking: What the heck am I doing and why am I doing it? Seeing artist galleries with such strong and carefully considered work makes me feel even fuzzier than I usually do. So I am asking myself lots of questions and still turning in circles a bit. My conclusion for now is that I am not aiming to be a famous fiber artist; I am aiming to enjoy the processes I try and make pieces that satisfy me. I am hoping some sort of coherence will emerge eventually. I am going home determined to keep pushing forward on City & Guilds and to do so bearing on mind that it is precisely the design expansion opportunity I need. Looks like the blog will be interesting! A technical thing: Could you check how you're posting links? They're not working for me, either in this post, or in the 12x12 post announcing the blog. Thanks. Do you have any links to examples of the hand stitching and embroidery that were used in a different ways? Perhaps some of the artists have websites? Thanks for allowing eavesdroppers! Now I have a couple of things to look for when attending PIQF in October.